Iwachu's Cast Iron Pan is perhaps the best investment you'll make for your kitchen. Along with a sharp kitchen knife and a sturdy cutting board, a cast iron skillet is one of the most important investments you can make for your kitchen. Even though it looks like a tough material, caring for a cast iron surface can be a delicate thing. The requisite seasoning, the soapless cleaning, the sticky residue- cooking with cast iron means keeping a few rules in mind, which can seem intimidating for first-time cooks. Still, you’ll find that once you take the plunge (and master a few tricks of the trade), you’ll have made a kitchen friend for life. With this in mind, here are some of the most important things to keep in mind when using and caring for cast iron cookware. A cast iron skillet is a classic for several reasons: it heats evenly, it’s powerful, it's practically indestructible, and it's versatile enough to cook almost any dish. The more food it cooks and the more use it sees, the better it performs. Cast iron has excellent heat retention and can withstand high temperatures without damage, allowing you to cook dishes that require a high flame and low simmering heat alike. Consistent heat retention keeps your food warm even after it’s removed from the fire, and its sleek look lends itself well to a rustic table setting. From function to aesthetics, a cast iron pan is the whole package. “Seasoning” is the term commonly used for introducing fat or oil into a cast iron surface to create a natural non-stick coating. It’s an important step to prep a cast iron surface before first use. First, wash your pan and scrub the surface. fill your pan with hot water and place it over a heat source, warming it to around 200°F or until the water has evaporated. This will allow the pores in the iron to open and accept the seasoning. Take an oil with a high flash point (you can use anything from canola oil to lard, but we’ve found that flaxseed oil is your best option for a glossy, food-safe seasoning), and coat the entire surface of the pan with a dry cloth. Flip the pan over and continue to coat the bottom, sides, and handle. Heat your oven to 400°F and place your oiled pan face-side down on the top rack. Place a piece of aluminum foil in a bottom rack directly underneath the pan to catch any drips. Let it bake for an hour, then turn the oven off and let your pan cool inside the oven. To keep your pan fresh and maintain the non-stick surface, make sure to re-season it once a year. You’ll need to scrub your pan with water and a wire or boar bristle scrubber to get it back to its original raw surface. Seasoned (ha) cooks will tell you that there’s not much that doesn’t benefit from cooking over cast iron. Pizzas, seared steaks, roast chicken, pasta, and pies are all fair game. When breaking in a new pan, we recommend cooking foods with high-fat content first to help with the seasoning process. What doesn’t work? Acidic foods, like tomato-based recipes or anything involving vinegar or lemon juice, can take on a metallic taste from being cooked over cast iron. Acid can break down your hard-earned seasoning as well, so it’s best to use a different surface (like enamel or stainless steel) for these types of foods. Avoid flaky, delicate fish dishes like tilapia or flounder, as they run the risk of falling apart when cooked on a hot cast iron surface. Because soaps can break down the oily seasoning you’ve worked so hard to achieve, you should never use soap to clean a cast iron surface. Instead, wash the skillet by hand using hot water and a stiff brush only. You can boil the pan with water, or scrub it with a paste made from sea salt and water for especially stubborn residue. Thoroughly dry the pan after cleaning with a kitchen towel. Apply a light layer of vegetable oil with a towel, and store in a dry place. 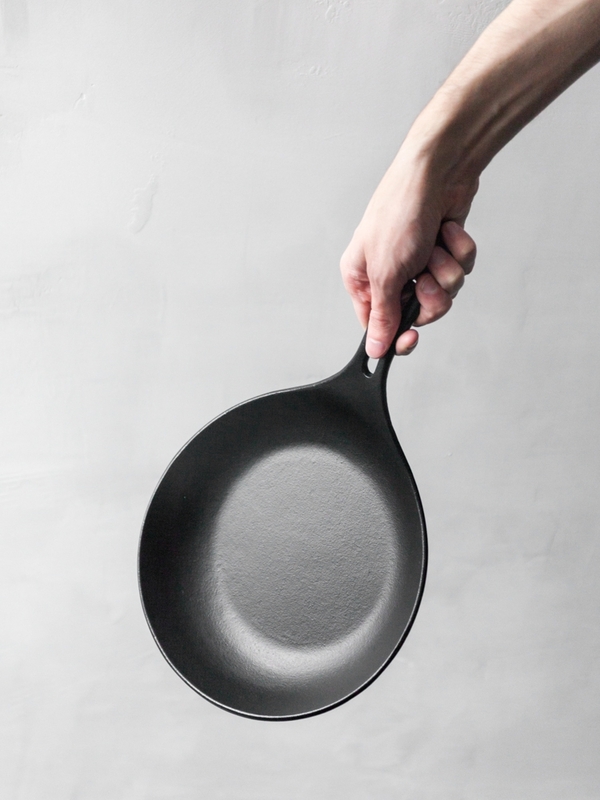 Make it a priority to clean the pan or skillet immediately after use and avoid soaking the pan or leaving it in the sink, as it may cause the iron to rust.